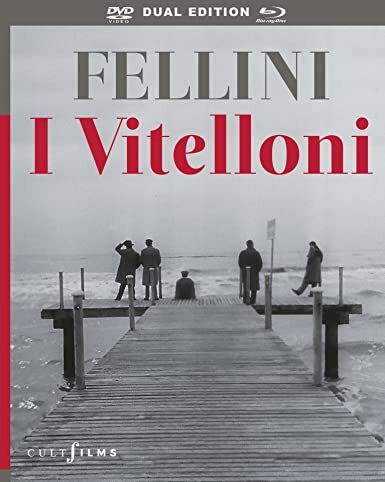 Product Description: The original slacker film that spawned an entire genre, I Vitelloni (loosely translated as 'The Young Bucks') is the story of a group of five long-time male friends who are still coming of age in their 30s. Mostly unemployed and too old to be kids, they struggle with their uncertainties about settling down in their Italian seaside town. This masterpiece is being released on this wonderful UK Blu-ray + DVD + digital on all platforms including Amazon.com courtesy of the one and only company Cult Films. This is a masterpiece of Cinema as I have mentioned. One of the great movies of all time. It is to me one of those films that is a must-see piece of cinema. It's one of those classic films that creates an emotional reality in the viewer. It's one of those films that is a defining moment in cinema history, and this film has never looked any better than this wonderful amazing transfer, to this beautiful stunningly Perfect Blu-ray. This is considered one of Fellini's best films, I mean it's by Fellini all his films are truly mastery gifted creations. Cult Films has done a stunning job in capturing this masterpiece of Cinema on this high quality, beautiful transferred Blu-ray, plus dual Edition alongside the DVD. This limited edition HD restoration Blu-ray / DVD is something to own, something to praise and something that any Cinema buff should have in their collection. This is a coming-of-age movie, somewhat autobiographical about the director's Seaside hometown. It's about a clique of friends. A clique of male friends who want or decide not to grow up. All of them are in their 30's. This movie has influenced countless directors and countless movies have been attributed to this masterpiece. If you watch this movie and rack your brain with all the movies that came after it, you can really see how so many movies after the year 1953 captured Fellini's true essence in this film; majorly in the 70's and 80's realm of cinema. Most of all this is a comedy. It's mixed with a dramatic appeal. It's a movie that I believe we all can relate to in one way or another. We all have experienced somewhat this reality in our lives, never wanting to grow up, or wanting to stay a certain age, wanting to feel like we're young again. We all have that moment of "No I don't want to be an adult". This is Fellini's second solo directorial film. As we all know Fellini would go on to direct so many amazing movies such as La Dolce Vita, 8 1/2, The Clowns, Amarcord, just to name a few. He was a director above and beyond what I consider Cinema. He was a director that could capture a living, emotional reality on screen. He made you believe his characters. He made you believe his scenarios. He let you become a part of the situation taking place on screen, and this movie is a prime example of that reality. His touch of "Cinema Brilliance" is captured in this movie. Some interesting little tidbits about the film. It was nominated for an Academy Award for best writing in 1958. It also was the recipient for the Venice Film Festivals Silver Lion award in 1953. What makes this movie stand out is as I have stated, it's autobiographical from the directors home and also societal changes in the 1950's Italy. You could see some of the realities taking place in society on the screen in this film, making it stand out as having autobiographical elements. All the actors and actresses with in this film are stunningly brilliant and craft, award-worthy performances. I think the one that truly stands out the most is Franco Interlenghi, playing the character of Moraldo Rubini. A wonderful prolific actor starring in over 100 performances in feature films and TV entertainment. He actually starred in so many wonderful films. All one has to do is look at his vast career, from 1954's The Barefoot Contessa, 1957's A Farewell to Arms and so on. He shined and gave his all in I Vitelloni. Cult Films has crafted perfection. Another Flawless example of how to treat audio and video on an older film. The film was transferred to high definition flawlessly. Another example of a fine product by Cult Films. I see no flaw in the audio and no flaw in the video. The movie has never looked any better. The special features you get new improved English subtitles. A unique commissioned video essay by Oxford Professor Guido Bonsaver titled “Becoming Fellini”. Another highly recommended Blu-ray. This transfer to high definition is a stunning example of what Cult Films honors and gives the cinema loving world. This is a Flawless Blu Ray in video and audio. Again, highly recommended. Make sure you head over to https://cultfilms.co.uk/ to buy all the wonderful Cult Films Blu-rays. The main page that gives you these beautiful releases on top quality Special Editions.